Our brand-new VoIP H.323 SDK provides a powerful and highly customizable solution to quickly add H.323 based dial and receive phone calls features in your software applications. Voice over IP H323 SDK accelerates the development of H.323 compliant soft phone with a fully-customizable user interface and brand name. It enables a worldwide communication over the internet or intern networks either by speaking and delivers superior voice quality. ...... 323 compatible devices (hardware and software). Voice over IP H323 SDK enables a worldwide communication over the internet or intranet networks delivering superior voice quality. Voice over IP H323 SDK supports DTMF, adaptive silence detection, adaptive jitter buffer! Abto LLC VoIP H.323 SDK is based on IETF standards (H.323, STUN, etc. ), so it should be compatible with other standard based products such as Asterisk, GNU Gatekeeper other. 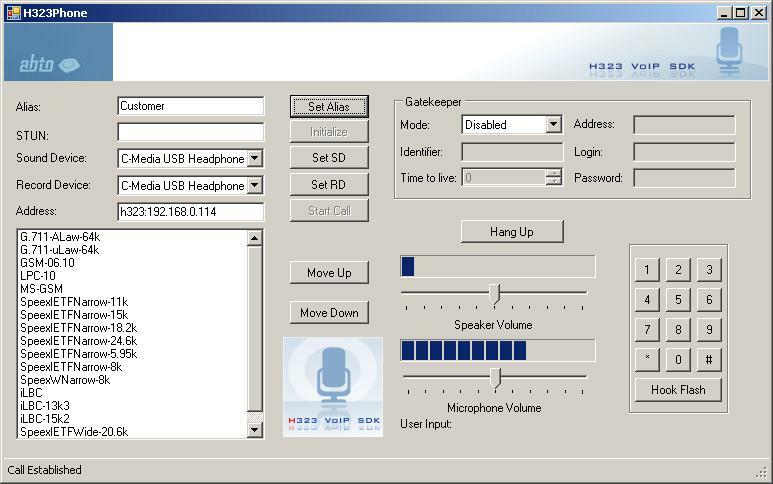 what is new of Voice over IP H323 SDK? Qweas is providing links to Voice over IP H323 SDK 2.1 as a courtesy, and makes no representations regarding Voice over IP H323 SDK or any other applications or any information related thereto. Any questions, complaints or claims regarding this application Voice over IP H323 SDK 2.1 must be directed to the appropriate software vendor. You may click the publisher link of Voice over IP H323 SDK on the top of this page to get more details about the vendor.